This is the thread for the Five Lined Dumpy Family my White's Tree Frogs and Southeastern Five Lined Skinks. We will talk about their enclosures, diets and any news regarding them. 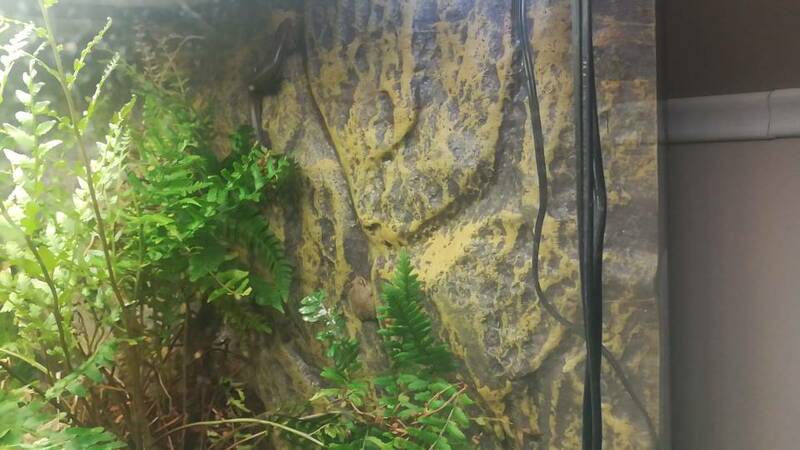 The Skink Dynasty is scaped after the Southeastern United States. Carolina's to Northern Florida. Both enclosures are together for me because they are side by side literally and are my only exotic animals. So I decided to include them together. The leaders of the Five Lined Dumpy Family are Max and Pharaoh. It will be interesting to see how big Max gets. Both animals control the ecosystems respectively. Pharaoh can accept or reject an organism and kill or eat it. He chooses which is how the Squirrel Tree Frog, Snails and Millipedes are in the Skink Dynasty. If Pharaoh wanted to he would kill or eat everything else. Everything essentially works for the Skinks. The Snails eat decaying plant matter as do the Millipedes but the Millipedes eat poop of the lizards. So they clean up the enclosure. 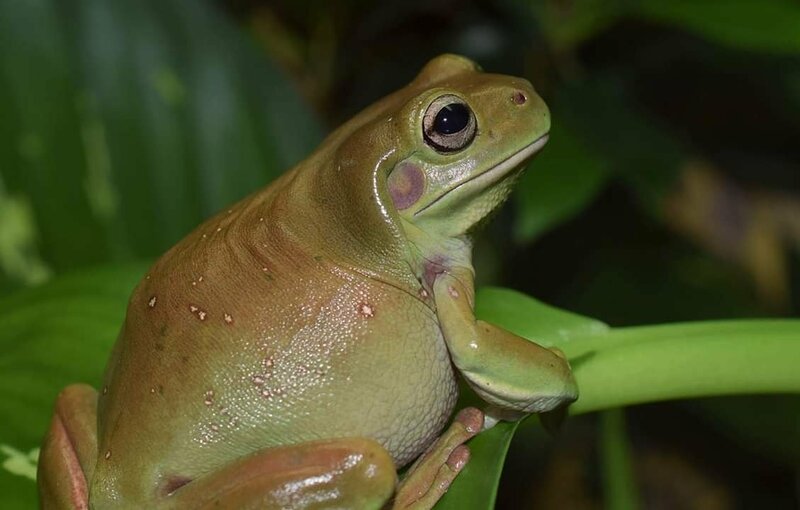 The Squirrel Tree Frog is night shift security because he consumes any small insects that could potentially bother the Skinks while they sleep. Max controls her environment because she eats as much as she wants. She is dominant and will pester the males if they take her food. She's not always aggressive to them. I find Spurgeon sitting with her late at night. Max has eaten fish before and attempted to hunt Fin once but could not get him as Fin was too deep and in the center of the water so Max could not get any footing. She ate Minnows before and assuming she got a good shot she would attempt the Betta Fish. Fin is the king of the waters. While Max may be a threat it's not usual for her and Fin to interact. They have actually lived together almost a year and only become aware of each other once. That's not bad. Fin controls the water because any fish introduced he fought and it was immediately removed. This is a little bit on the leaders of the Five Lined Dumpy Family. We will be displaying Kingdoms which will show daily life for these animals and how the leaders maintain their control of their ecosystems. To see the Skink Dynasty being built check this out! The Skink Dynasty was updated today! So I got some really good news all around. Amsi came out and blessed us with her presence. She looks pregnant and I think that could be really cool if she is. She is puffy and she allowed me to record her when she was basking. I caught the first ever time Florence the Squirrel Tree Frog was on the floor of the enclosure. I never saw him on the ground. He was hunting something which was pretty cool to see. I caught in daylight the one snail eating the Pachysandra. I was laughing but sad too. I hope he doesn't eat it all. I'll have to feed him more so he stops. I added a small under tank heater to the side of the enclosure where the Skinks bask. This is so they can get even warmer and bask faster. I wanted this to help the lizards to be warmer. I also made a small rock pile so the Skinks can feel more comfortable. They hangout in rock and wood piles. The insects also enjoy this because they feel more comfortable with more hiding spots. I added a small piece of corkbark to the enclosure to help the Skinks feel more at home. I will have one side with wood and one side with rocks. The Millipede and Snails went to the wood and were investigating it. The Millipede burrowed underneath and the Snails climbed it. I have decided a few major things for the Skink Dynasty. So there will be a few more inverts and an unlikely resident. I will be looking into adding more Millipedes, hopefully more Snails, Leopard Slugs and possibly Darkling Beetles. I will also add earthworms to the soil so the Skinks can hunt them when they burrow. The Skinks actually are a burrowing species so they hunt earthworms in the wild. I'm excited to add a few more inverts. There is one more to add and I don't have to find it I already have it. Under circumstances of tragedy I will add the baby Cope's Gray Tree Frogs to this setup. I will explain more why in the Gray Tree Frogs thread but these frogs are actually babies from Charlotte so they are southern. 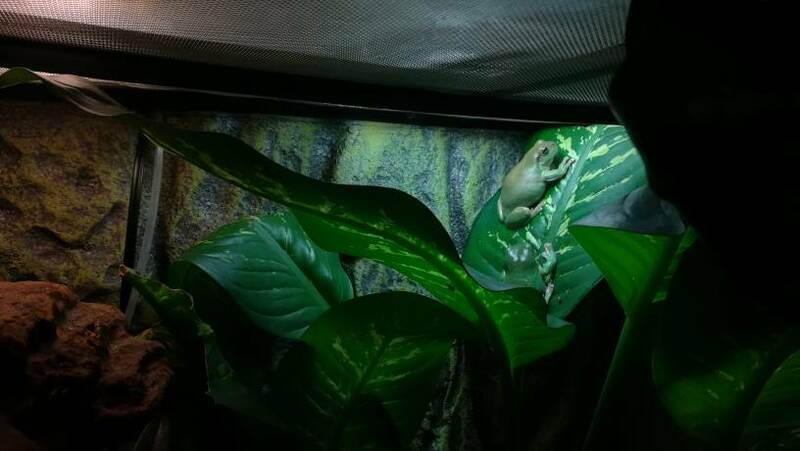 I was not planning on breeding the Gray Tree Frogs but because their home is gone and frogs are dying I will attempt to collect them this spring and breed them to release them in another area. The addition of the Cope's Gray Tree Frogs will make for the first time I ever had mixed tree frogs. The Cope's is also from the region of the Southeastern Five Lined Skinks and Squirrel Tree Frog. Charlotte is where the Gray's are from and Myrtle Beach is where the Squirrel Tree Frog is from. The temperatures are very close. So this will work out. Maybe it's better for the little babies two of them that have deformed legs to be in this setup. The Skinks aren't going to harm them and the Squirrel Tree Frog is too small to compete for food with them. The babies should be okay in here as opposed to battling my two studs Christian and Bane in an all Gray Tree Frogs enclosure. Plus the Mosquito Fish might have picked at their limbs. This will give even more life to the Skink Dynasty and will mean there are 3 tree frog species in the Five Lined Dumpy Family! This is truly the year of the Tree Frogs! What do you think about the addition of the baby Cope's Gray Tree Frogs? Are you interested in seeing the additional inverts? Are you excited to see the beginning of the Five Lined Dumpy Family on YouTube? I am going to create an Instagram for the Five Lined Dumpy Family! The Instagram will feature them but you will see appearances by the Native Amphibians. The Facebook Page will feature the Native Amphibians. I want to use the Instagram for just the exotic animals because I want to make something just for them because they are as important to me as anything else. I cannot stress how important they are to the channel and the happiness I get from caring for them. This is something exclusive for them and I'm excited to give more depth to the Five Lined Dumpy Family! I'll let you know when I create the Instagram! This is a new thread please do not delete this. Both enclosures are doing well and I wanted to take a moment to say what these enclosures are considered. Both the Dumpy Family and Skink Dynasty are a Forest. The Skink Dynasty is a Southern United States Subtropical Forest. This enclosure will have the most biodiversity containing many inverts and of course the Skinks. Some frogs will also live here. I was able to record many good clips from the Skink Dynasty. Many inhabitants were filmed. I am waiting to get one more good shot of Pharaoh the male Skink. He's been very skittish lately even more then usually. There are many new faces to come to the Skink Dynasty. 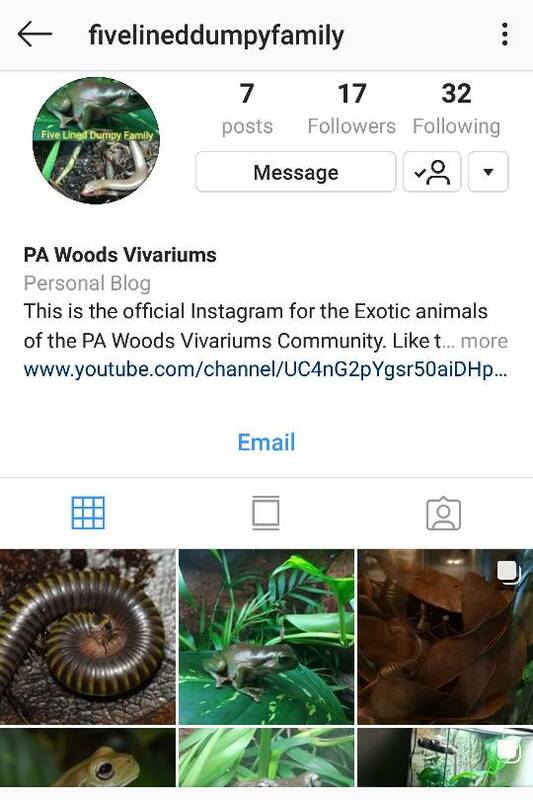 The Instagram for the exotic animals is up! Checkout the about section on the YouTube Channel to follow the Five Lined Dumpy Family! The Dumpy Family is a Tropical Forest. Not to be confused with a Rain Forest because there is no misting system. It's humid and a warmer climate. This is home to just the Dumpy Tree Frogs and Fin the Betta Fish. I was able to film the Dumpy Family like never before. In the next video we will explore how special Pharaoh and Max are to their ecosystems. They will face a familiar foe that has been seen on the channel. Kingdoms is still in recording for the first episode but this is the main series for the Five Lined Dumpy Family. What would be a cool invert to add to the Skink Dynasty? 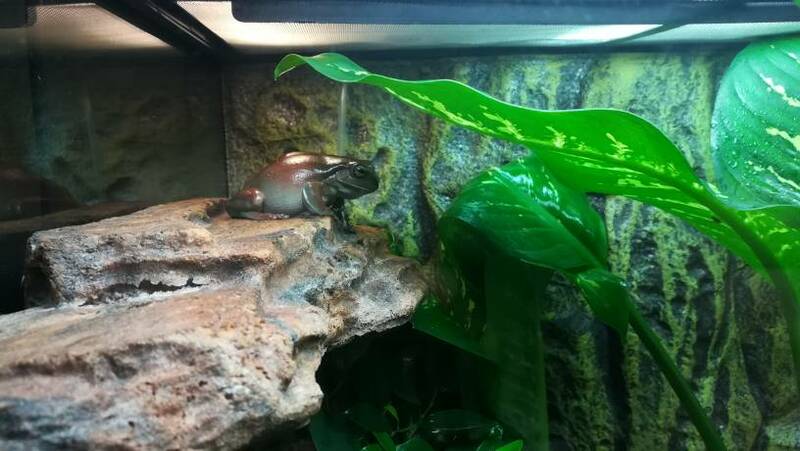 Do you have an amphibian or reptile among others that is the dominant? That's exactly what's going on with the Skinks and White's Tree Frogs. I have the video in the finishing touches which may be by the end of the week as a release but maybe earlier. This update will show the animals and enclosures unlike any other video they were in. I got a rare shot of Pharaoh the male skink ambushing a cricket. This has been a rare occurrence so I think it will be a big part of the video. It will drive home the point of how he is the Dynasty for the Skink Dynasty. I got the Squirrel Tree Frog in much better quality clips so you will get to see how beautiful he is. He hasn't eaten in front of me yet either but I believe he will. The Cope's Gray babies are in the video. They are going to make an appearance when they grow more. I captured Amsi coming out as well. I've noticed the Skinks and Squirrel Tree Frog coming out more so they will be captured in more clips to make for even better display. There is some sad news on the way but I'll save it for the video. A new addition is also on the way. Some Millipedes and Giant Isopods. I will have an unboxing video of them to come. These are going to be in the second episode of Kingdoms not the episode coming this week. The Dumpy Family was captured in some very interesting shots because I actually went into the terrarium to video them. They allowed me to film them living their lives. Max shows her dominance and how just like Pharaoh she is the leader. Max shows her alertness and tameness. She also shows that the other frogs are her family but also she eats first. You will be pleased to see how the Forest has come along. I am beginning to get that dense closeness a forest would have. After the video was shot I added some more plants so you'll have to keep up with the series to see the updates to both enclosures. If you haven't seen or don't follow the Gray Tree Frogs thread let me fill you in on what's going on. The PA Woods has been divided into factions (two enclosures being presented together for more interest and education). The upcoming faction of my Gray Tree Frogs (Gray Army) and eventually Toads (and maybe something else) will rival the Five Lined Dumpy Family. While each enclosure is unique the the specific animals I believe bringing these two upcoming enclosures together for documenting will be very interesting and will feel much more fluent. You will get a small idea of what this will look like when Kingdoms premieres this week. So the Five Lined Dumpy Family will have to step it up being the first faction of the PA Woods Community. Soon the native species faction will be rising up to challenge them. I hope to bring competition between these two factions in an attempt to excite followers and viewers and encourage them to support their favorite faction. This will force me to try to constantly out do myself for better content which is good because it give me more motivation to get better. I have not yet named publicly the name of the upcoming faction. I will be waiting for a little bit longer until the completion of the Gray Army's enclosure is completed. The hope is this new faction will not have to hibernate to breed. They will be both in their own respective Biopod. The hope is that I can turn the temperature down to cause a cooling season for the Tree Frogs and Toads. Then we can have an active and all year running rivalry between the factions. The 125 gallon is still the center of the PA Woods Community, but it has to go through a massive makeover and the animals are being treated for nematodes. So while they get treated and the tank gets redone the factions will rule. The 125 gallon is not in a faction as it will be the only aquarium I'll own. It's in its own category. The 125 gallon will be inactive for many months as the animals hibernate which is really when we will rely on these two factions for content. Kingdoms is the feature series for the Five Lined Dumpy Family. the other faction and the 125 gallon will have a feature series as well. Kingdoms will be the kickoff of a new direction of the channel and everything in the PA Woods Community. This is the transition into increasing quality content and better more organized discussion on the forums. The Five Lined Dumpy Family is going to really impress and surprise the PA Woods Community. Sorry for a long post mostly of what the factions will consist of and their direction. I just wanted to let you know what is coming! Do you want to see a feeding video of the babies in the upcoming unboxing video this week? What are you excited to see in the first Kingdoms episode? So I actually made the first episodes of the series and posted it but the video was messed up from my laptop so I had to take it down. When I was going to edit the video it crashed and I lost the video completely. So I was able to get a new laptop which might come tomorrow actually. I'm not sure if I said this in the post for the Five Lined Dumpy Family but the new laptop will give me the ability to post videos at the highest quality that my camera is able to. My editor and camera can shoot 1080 but my old laptop could only handle 720. So you'll see Kingdoms in the best quality of all the series I've ever made. You'll see the animals in a high quality as well. 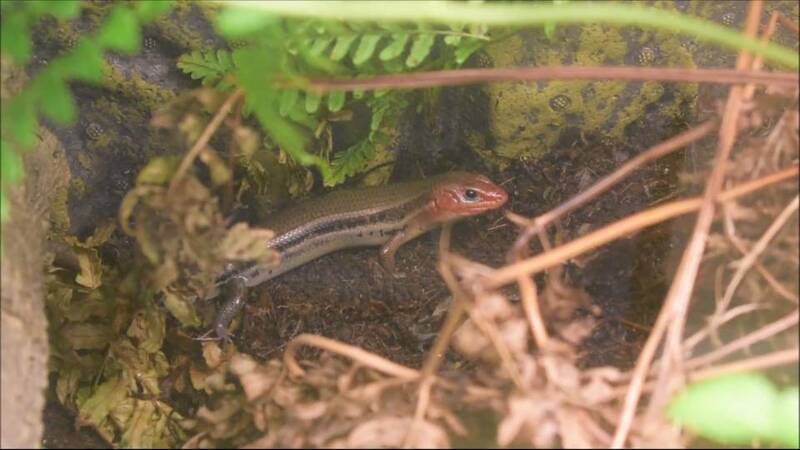 There are many new inhabitants that are not able to go into the Skink Dynasty but are being nursed into adults. This may hinder the biodiversity of the ecosystem currently but the assistance is on the way. With the first video needing to be created from scratch again it might make the episode better. I can add some more interesting clips to keep you more engaged I feel in the story. There is a little drama in Kingdoms as we have death,life and mystery all going into the first episode. The Dumpy Family is doing well and rolling as usual. The baby Cope's Gray Tree Frogs are growing. The one baby that's the healthiest is getting also big enough for small crickets. It might be the beginning of summer when they join the Skink Dynasty. The Bumblebee Millipedes and Canyon Isopods are being nursed to grow so the Skinks don't eat them or attempt to. If your wondering we still have a female Squirrel Tree Frog and some more inverts to be introduced to the Skink Dynasty. I'm waiting for the new laptop to begin the episode so it might be early March for the episode. I might have another trailer and the unboxing of the inverts coming before the episode of Kingdoms! Would you prefer to see an episode around 15 minutes or around 20 minutes? What is your opinion on adding invasive species such as the Canyon Isopods? Should this be something we discuss in Kingdoms? Two trailers have been put up and the Five Lined Dumpy Family brought us to 100 subscribers! Let's hope their series can bring in more as we move closer to Kingdoms! There is a vote happening and it's almost over! It's to decide how long this series will be between 15 minutes and 20 minutes. The voting is very close I can't believe how it's one away from a tie! I'll update you all when the voting is over as to how long I have for Kingdoms! I've been feeding the Skink Dynasty more and letting it dry out more and all the inhabitants are more active. The babies are growing and one baby is getting big it may be a female. The Bumblebee Millipedes are doing well. I'm not sure how long they will have to stay out of the Skink Dynasty. They need to grow more first. I'm looking forward to showing the lives of these creatures in this setup and also the Dumpy Family. I see Spurgeon is becoming more bold now that I've had him close to a year. He is out more and stays with Max usually at night. Jeremiah is shy still. He's eating though. He's still doing well. Fin eats all day. He has it good because I throw food in for him whenever he comes out. He's a smart fish. I'm happy that the Five Lined Dumpy Family is completed mostly. Some devices, plants and for the Skink Dynasty some animals are to be added but it's mostly complete. I am very happy to be starting the year talking about these guys. Finally they get a chance to show us their importance and fascinating behavior. I am very interested in creating the other faction the Utopians to face the Five Lined Dumpy Family. Maybe we should have that as a vote later on. Would you want to see the animals of the Utopia Faction even in their smaller quarantine enclosures? The Gray Army will be back in the 30 gallon. I'm excited to just have holiday specials and to see the two sides faceoff. The Kingdoms episode is coming after the 100 subscribers special. Should I do a live video sometime soon of the Five Lined Dumpy Family? Would you tune in? Should I give another update on the babies and Millipedes sometime soon? So we had a good turnout for voting! It was a close vote. 1 vote could have tied it up. We were voting on how long Kingdoms was going to be per episode. 15 minutes won by 1 vote. This tells me though with that close of a vote I will try to be around 15-17 minutes so the people who voted for 20 see I am going to honor their vote! Kingdoms is going to come after the 100 Subscribers Special. A small update on Max the matriarch. She may have a fungus infection from too high of humidity. I since have made changes to the enclosure. I'm going to take Max to the vet just to be sure and to make sure the leader of the Dumpy Family is healthy for her time to shine! She's still hungry and active and alert. I'm not sure if she's sick but I'm going to make sure we know for sure. There is going to be a change for the Millipedes. Joining the Bumblebee Millipedes will be the Smoky Oak Millipedes because they are bigger and more colorful. So get ready in the coming episodes to see a lot of Millipedes! I am going to search for Leopard Slugs and maybe more snails. I won't add too many just 2-3 more so there is a small colony. I also found another invert we will attempt to add but it's a secret. The inverts in this setup will be incredible. The baby Cope's Gray Tree Frogs are growing and the one baby who has no deformity might join the Skink Dynasty without it's kin. I believe it's a female from size but it's bigger and more dominant then the others. It might beat out the Millipedes, Isopods and other babies! It would be interesting to see how Florence the Squirrel Tree Frog will act not being the only frog. Remember there may be 5 total frogs in here with 3 baby Cope's and a female Squirrel Tree Frog joining Florence. The Skink Dynasty is the most biodiverse enclosure I've ever created! Spurgeon has grown and is out more now. He looks good and you will see more of him in Kingdoms. Jeremiah is still shy but I will try to get him more into the second episode. The Skinks are great and actually Amsi is out every day now. She never came out like this before so it's nice and she's much more tolerant of people now. You'll see a lot of her and her relationship with Pharaoh in the first episode. I am very excited to begin the process of creating a great series for you all in the PA Woods Community. Stay tuned for Kingdoms coming soon! Thanks for voting! Let me know what you think of the voting and the update! It's not a good one guys. Luckily no frog or lizard is harmed tonight but we learned something has happened and there is a change coming for the Skink Dynasty. So I was feeding earthworms to my toads of another faction and I learned from my vet tonight the worms carried a parasite nematode. My toad is being treated so it will be okay I have dewormer on me. However the Skinks were offered the same worms. So now they do have some type of parasites if they didn't already. I'll be monitoring them carefully they have been doing well and I've been feeding them more so that's good at least. 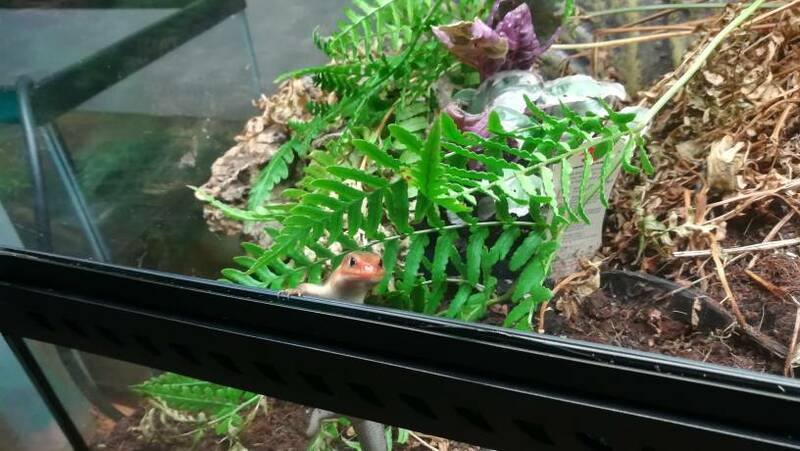 The Skinks and tree frog have been doing well adjusting to the new climate and enclosure. The inverts however have been passing away. Kingdoms will talk about this too but I'm thinking part of it is because my environment is a little too sub tropical for the inverts I've had and also the nematodes could be killing them. The Bumblebee Millipedes are zoned for this climate so they should thrive. So the big update is that the Skink Dynasty has been invaded by the nematodes and potentially claimed casualties. The Dumpy Family is going to be examined by the vet from poop samples and Max will be going to the next appointment. So the Dumpy Family will be taken care of first just to see how they are. They are an older group and need to be respected as being on my care first. I plan on getting the Skinks looked at but it will be a little bit. I'm working on getting other factions done first to at least have someone done. So nothing good to report on but I'll have more on the news this weekend. Maybe we will see Kingdoms soon! There isn't too much to report on with the Five Lined Dumpy Family but enough for a good post. The Skinks are doing well since being most likely infected with the nematodes in the worms. I've been feeding more to help them poop out more even though it may not help they will gain weight which they need. Florence is eating but I haven't observed him hunt yet. The babies are growing but not yet big enough to go in but I'm not putting them in until the Skinks are treated for nematodes. The inverts are good and the Bumblebee Millipedes are growing bigger. I'm very happy to have them. The Dumpy Family is okay. Max is going to the vet so we will see how she is doing. She's been good and alert but I think she looks like she has something on her legs that can be treated now so nothing gets fatal. 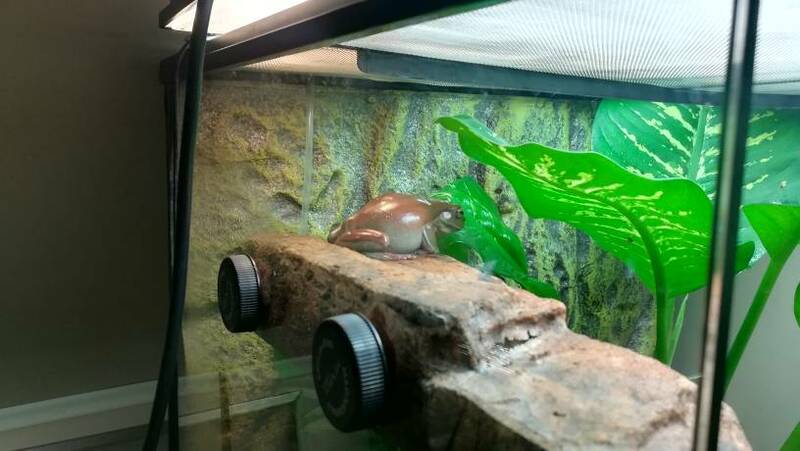 Fin is happy and the male frogs are doing well. More active! Kingdoms will still go on as Max is being treated because she is staying in her home. Nothing will break up the Five Lined Dumpy Family. They will be treated as a group. So we won't have any division. Kingdoms and the Five Lined Dumpy Family are going to have some competition coming. As I've been saying with more animals getting healthy and reunited it will create other factions that will be pushing the Five Lined Dumpy Family to have better coverage and will hopefully create some dedicated fans to their favorite faction! Kingdoms will come out after the 100 subscribers special which will introduce the challenger the faction that will compete all year with the Five Lined Dumpy Family. After we hear of the other faction we will see Kingdoms. Make sure to checkout the Instagram of the Five Lined Dumpy Family! They need your help to grow their fan base! Instagram will be for exclusive content on the Five Lined Dumpy Family so be sure to follow them to see updates on them! Checkout a picture from the Instagram page below! The first video of Kingdoms is almost done!! Last night I finished up putting together the footage for Kingdoms episode 1. It is a much better story then what would have been if the episode prior posted. I'm very excited for this to be released. I have to do the audio for the video still so hopefully by this Friday it can be out. It will be slightly did then what I originally thought but I found a great story and I think this is the most angles and the best quality for the clips that I have put together. It will be the first series released to my channel in 1080 and 60fps. The episode is under 16 minutes so far and it might end up staying that way. The Skink Dynasty will be the featured enclosure this episode and the Dumpy Family will be the second episode. I don't want to ruin too much. You will see Max appear in episode 1 still but I don't want to give too much away like I said. There is death, life, and mystery in episode 1. Max went to the vet and they said she was okay but she could be developing some infection in her legs. So I will probably when I go back to the vet for other animals get a prescription for her. It's been pretty slow right now because I haven't been recording because I've been busy but I have enough content to get to episode 3! So I'll have plenty of time to get footage. The Bumblebee Millipedes and Canyon Isopods make an appearance and so do the baby Cope's Gray Tree Frogs. The babies are a favorite of many and so are the inverts. I take them seriously as a part of Kingdoms. It will be very exciting to see the day we can put the Canyon Isopods, Bumblebee Millipedes and Cope's Gray Tree Frogs together in the Skink Dynasty. Fin is doing well in the Dumpy Family. He's swimming around and is still very happy. Spurgeon has let me hand feed him so he's becoming more tame and comfortable with me. Kingdoms episode 3 will be fun showing more tame animals. I hope you are ready for the first episode of Kingdoms coming maybe this week! Kingdoms is finally out and the first episode has been doing well. It's the fastest video this year in terms of views but was not liked by as many people. There were a good bit of comments but I could always use more! Kingdoms Episode 1 features the Skink Dynasty and how Pharaoh interacts with his ecosystem. What was your takeaway from the episode? The future of the Skink Dynasty has many faces emerging from Millipedes to Cope's Gray Tree Frogs and it will continue to be a big part of the Skink Dynasty. The invasive inverts will add more conversation during the episodes in the future. Kingdoms 2 will feature the Dumpy Family and I'm not too interested to share the details but Max really shows up and I'm excited to feature their family. Kingdoms 3 has begun filming and in like 15 minutes I got some of the biggest clips of the video already. I believe that one part has never been filmed on camera and I'm very excited to see what else I can get on film. So I was waiting to post this after the third episode of Kingdoms, but I'm too excited to wait. So the Skink Dynasty has two possible discoveries. I'll explain the more interesting one now I can wait for the other. The Southeastern Five Lined Skink is said to only eat live insects, but I've been discovering something very interesting and uncharacteristic about them. I believe the Skinks are consuming carrots, blueberries and strawberries! There is one snail left in the Skink Dynasty and I put fruits in last night. I was anticipating the snail to eat all he could. This evening I saw blueberries taken out of the container and one was split into two and one was absolutely crushed. I'm only releasing the footage in the third episode of the berries. This was unbelievable to see the carnage done to the blueberries and I saw bite marks in the carrots. I will be working diligently to try and record one of the Skinks to see if they are truly consuming the fruit. If I get this on video it would be undeniable evidence. Why does this matter? Try and find information on American Five Lined Skinks eating fruit. It's not common and I haven't found any research to show they eat fruits. There is no research on the Southeastern Five Lined Skinks on this subject. This could explain more about these mysterious Skinks. We don't know much about this subspecies so this could be a real discovery! These Skinks can live on islands where no water is present to drink. No freshwater but they flourish. They would most likely find fruit on the islands and in their territory and the fruit especially has juice in it. Blueberries are sweet and would be very healthy for the Skinks to eat but they must eat wild berries as well. They could get an easy meal and water which makes it very desirable. These Skinks seem to be very opportunistic and I have more to back this up but I don't wish to reveal all yet. So they are very opportunistic and I would not put this past them. That would show a higher intelligence in my opinion that these Skinks possess. This could ask the question do Anoles eat fruits and vegetables too? Do other native skinks? What about other lizards if given the opportunity? Have you ever seen a native lizard eat fruit? Do you consider this to be a discovery?